Size of Male: 14 lbs., 10 in. Size of Female: 13 lbs., 9.5 in. The Cairn Terrier holds the distinction of being the oldest and smallest of all terriers. For all its cuteness, it is quite a robust dog breed with a long lifespan to boot. It will delight you and your loved ones with hours of tireless play and unconditional companionship. Though originally bred for their hunting skills, they also make wonderful pets for families with older kids. Before the 20th century, this small terrier used to belong to a collective class called the Skye terriers. The breed took after the name of the cairns or rock piles where the dogs were often seen trapping foxes and badgers. The dogs were no killers, however. They simply aided the early farmers. The 1930s film The Wizard of Oz bolstered the breed’s popularity. Dorothy’s pet “Toto” was a Cairn. This dog breed sports a mischievous streak which matches the dog’s hyperactive nature. They are rather quick to warm up to school-age children and make wonderful playmates. However, the dog’s strong drive to prey upon real or imagined animals makes them an unsuitable choice for owners who prefer to take leisurely strolls or for owners who enjoy teasing their pets. You’ve got to be in good shape to keep up with your Cairn Terrier. Living Environment – Indoor living is suited for the breed. However, a mid-sized, securely fenced yard is also recommended where the dog can play and run freely. Be prepared to keep your garden off limits and your home generally pest-free. This dog breed is susceptible to allergies and can easily attract fleas and ticks. Grooming – Coat care is generally moderate for this low shedder. They need bi-weekly brushing on the average. You may also rub its fur with a damp cloth instead of giving your pet a full bath. Clipping or stripping is done only when necessary, but eye, teeth and nail checks must be conducted on a regular basis. Diet & Exercise – The dogs are very easy to feed, although they can be quite possessive of their food. Their only dietary restrictions are corn, wheat or grain, to which the breed is generally allergic. Feed the pups thrice a day. As the serving size increases, reduce the frequency of feedings. Adult dogs must not be fed more than twice per day. Your pet’s appetite can easily lead to weight gain without daily exercise. The breed enjoys daily walks and physical games, although the actual need may fall in moderate levels. Caveat: Never leave the dog off leash in an unsecured yard. Their curious nature will make car chases, destructive digging and excited barking a challenge. Health – For a breed that succumbs to dog allergies and a host of health problems, they do sport quite a long lifespan. See your vet for potential health issues such as cataract, epilepsy, and joint pains. Intelligence is no question with this dog breed. 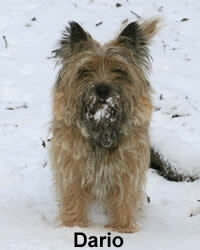 However, the Cairn Terrier?s bossy attitude requires the firm handling of a veteran pet owner. Once your pet sees you as its inferior, they can give you a hard time with dog training. Early training and positive reinforcement often work wonders. When well trained, these little terriers can stand out in obedience training routines.